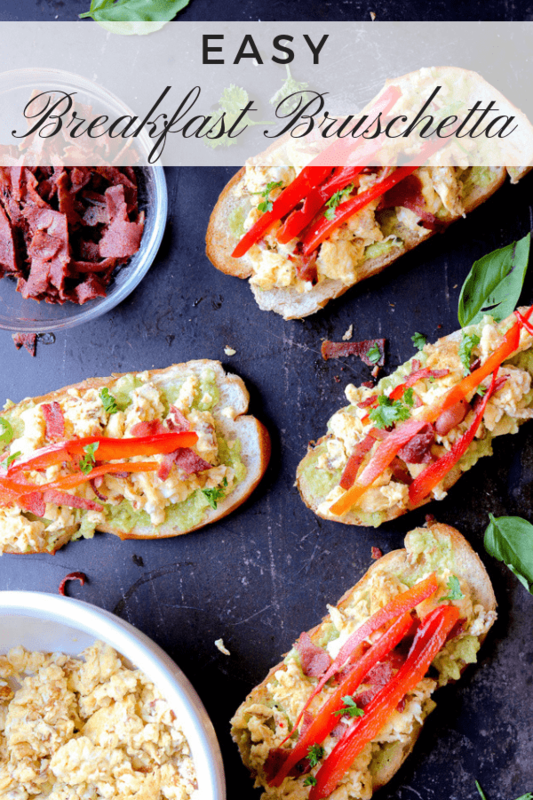 Easy Breakfast Bruschetta – Toasted bread topped with guacamole, eggs, and turkey bacon. This breakfast bruschetta recipe is not only easy to make but is also a great way to mix up an ordinary breakfast. Savory Thoughts: Stop keeping score; find ways to indulge in the things you love. Do not allow your emotions to manifest in a stubborn unwillingness to compromise. We definitely shouldn’t have to feel like we are compromising when it comes to certain things in life. I apply the same philosophy when it comes to breakfast. Do you agree breakfast is not the same without eggs? It doesn’t matter how they are prepared. Eggs add that special touch or final touch to any breakfast menu. I love the days when our schedule is cleared. It allows me the time to prepare a hearty breakfast for my family. 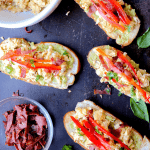 However, there are times when the schedule is clear, something simple but as flavorful as this breakfast bruschetta is also needed or wanted. Why this breakfast bruschetta recipe works? It is quick. It is easy to make. It is flavorful. And it is enjoyed by everyone. It’s a way to start the day on a healthy note with minimal effort. How to make breakfast bruschetta? If you’ve had bruschetta of any kind before, you’ll know there really isn’t a “recipe” for it. However, some assembly is required. The method for making this bruschetta is simple. 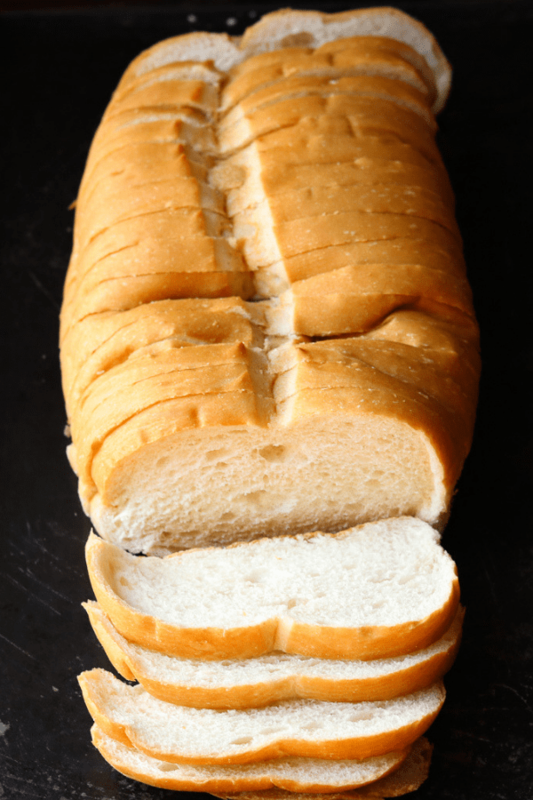 Think of it as adding all of your favorite toppings on a well-toasted bread. Which in essence, that’s exactly what you are doing. 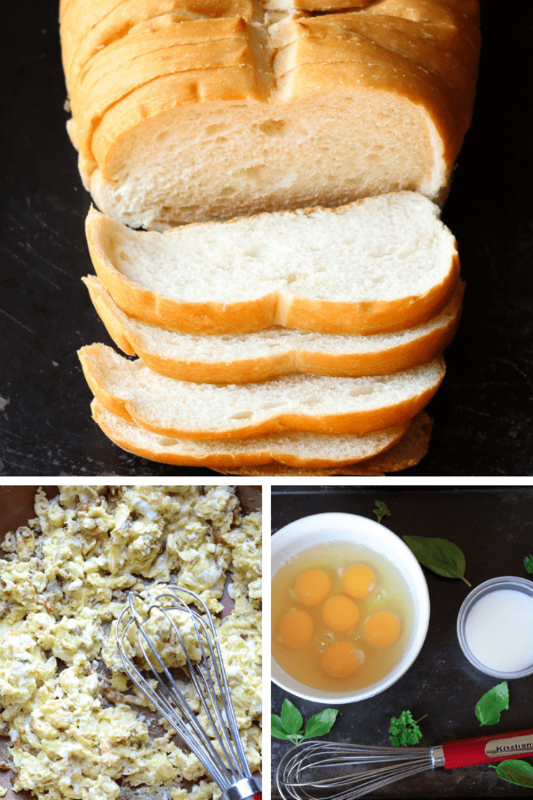 Simply toast the bread, prepare the guacamole, cook the eggs, cut up the veggies, and layer everything on the bread. Enjoy the bruschetta with a cup of coffee or tea. Did you make this breakfast bruschetta? Tag me on Instagram or Facebook and please give it a star rating below! 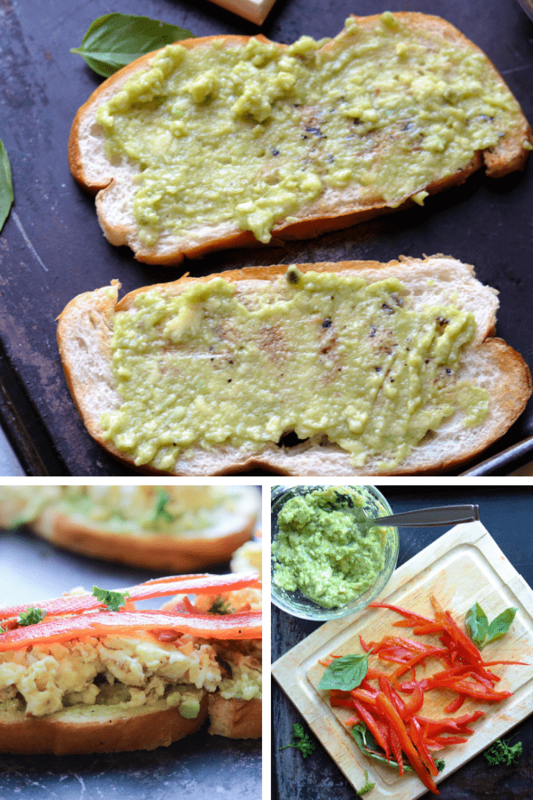 SAVE THIS BREAKFAST BRUSCHETTA RECIPE TO YOUR PINTEREST BOARDS! 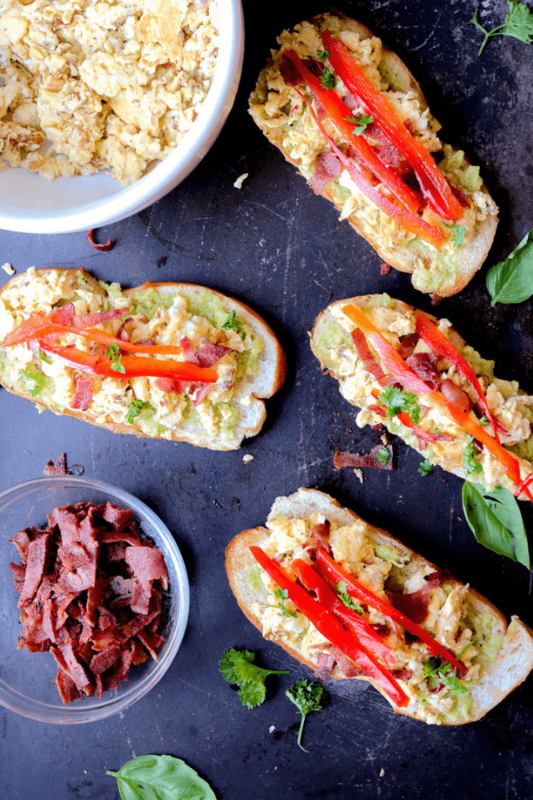 Easy Breakfast Bruschetta - Toasted bread topped with guacamole, eggs, and turkey bacon. 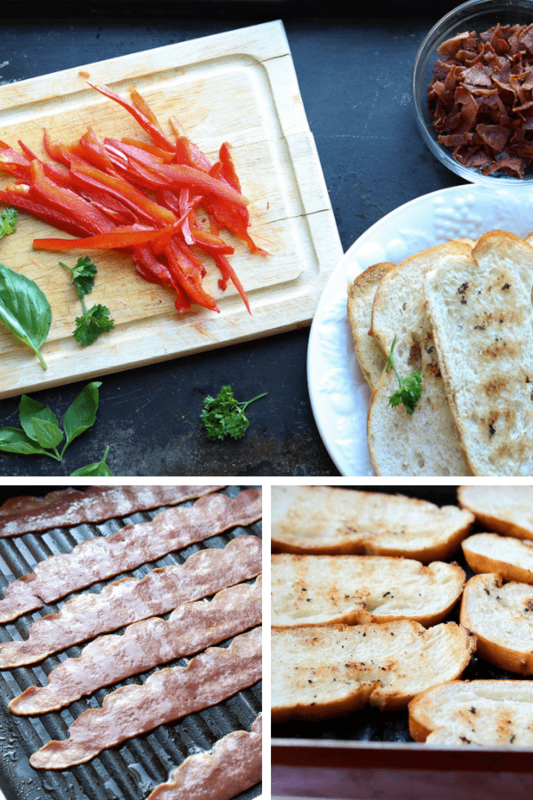 This breakfast bruschetta recipe is not only easy to make but is also a great way to mix up an ordinary breakfast. Spray the griddle pan with the cooking oil. Cook the bacon then remove from heat and set aside. In the same pan, grill the bread and set aside. In a medium bowl, whisk together the eggs, milk, salt, and pepper set aside. Lightly spray the skillet with cooking spray. Cook the eggs for 6 minutes and constantly whisk to scramble. Mix everything in a large small bowl. Set aside. Now this is my favorite breakfast! This is really a great job! An interesting combination of ingredients is, of course, I want to try your recipe. THANKS! A good way to mix up the breakfast routine! this beats oatmeal hands down. I think this will go into the weekend brunch rotation. A nice way to change my morning boring same old, same old into something new! . Good! I hope you like it. Thank you! I never even thought that bruschetta could be a breakfast dish – I’m kicking myself now. This looks and sounds amazing!! I have never had avocado on toast, but this sounds soooo good! I would love to try this for breakfast soon! This certainly is a yummy sounding recipe. We’ve gotten into a rut when it comes to breakfast so recipe would be a welcome change. I like the bacon plus the avocado on the toast. Guacamole for breakfast. I’m all for it. We love bruschetta in our home so this is definitely our kind of weekend brunch when everyone is home. Especially because I always have avocado at home..
Looks like a perfect breakfast to me! I would love this even for dinner some nights! That’s what I love about eggs, easily transformed from breakfast, brunch/lunch to dinner. Thanks for reading. That is delicious breakfast it full of veggies, eggs, I love this kind of bruschetta which is easy to put together but also tasty. I love this breakfast. It is very easy and satisfies everyone.